I am not one of these redneck, fanatically patriotic, my country right or wrong Americans but I am glad that with all the great British heavy metal bands that thrilled us with killer albums back in 1980, there were some great American metal albums too. Note: I have always loved the fact how the US and UK have supported each other in regards to metal and how that has grown to include Canada and eventually the rest of the world. This is why it was so important that in the pivotal year of 1980, American metal got on the scene as well. 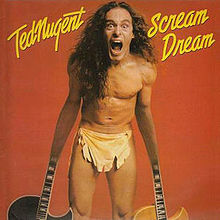 Arguably one of the best American metal albums to come out that year was “Scream Dream” by the Motor City Madman, Ted Nugent. “Scream Dream” is yet another album that makes me proud to shout out “I am a metalhead!” Of course the brilliant opening track “Wango Tango” opens this album with style and the title track is a great one to follow and so on down the line. Every song on this album is a winner and you would have to put two guns to my head to make me choose a clear cut favourite track and then I probably still couldn’t pick one. 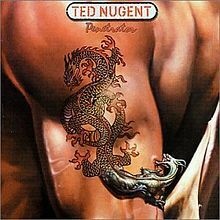 One aspect that shows up very well on this album is Ted’s versatility on the guitar and how he can wail or shred depending on the dictates of the particular song. “Hard As Nails” and “Flesh And Blood” are true shredders in the classic metal sense. But he is able to go into a more blues based melodic solo on “Spit It Out” and does so like the true pro that he is. Then there’s the next to last song, “Terminus Eldorado” that to me sounds like an early forerunner to his future 1986 hit, “Little Miss Dangerous.” On “Scream Dream,” Terrible Ted proves that you can be versatile while playing some outstanding metal. There’s not much more I can say about this album, only that it is metal as metal was intended and yet another great album that was made in a year of great metal albums.